I decided to boil this for my family. I like to drink this watercress soup which is served by the vendor selling mixed vegetarian rice near my office. I took note of the ingredients they used and made some adjustments of my own. This is the first time I boil savoury soup without any meat. Being so used to having meat in soups, I was initially very worried that this concoction may not turn out well. 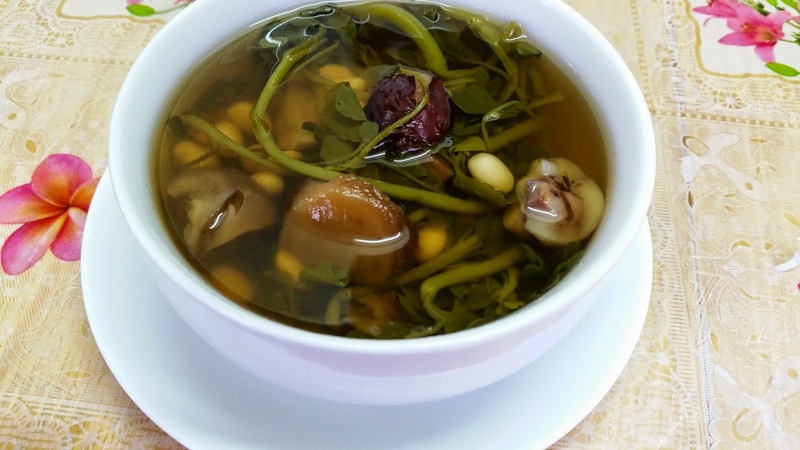 As the soup was boiling, I have to keep reminding myself that the meatless soup served at the vegetarian outlets tastes wonderful, so mine would taste superb too! I am so happy that this combination of ingredients blended beautifully to make the soup so clear and sweet. A sweetness that is so natural and pleasing to the palate. I just love the aroma of the mushroom stems in the soup. 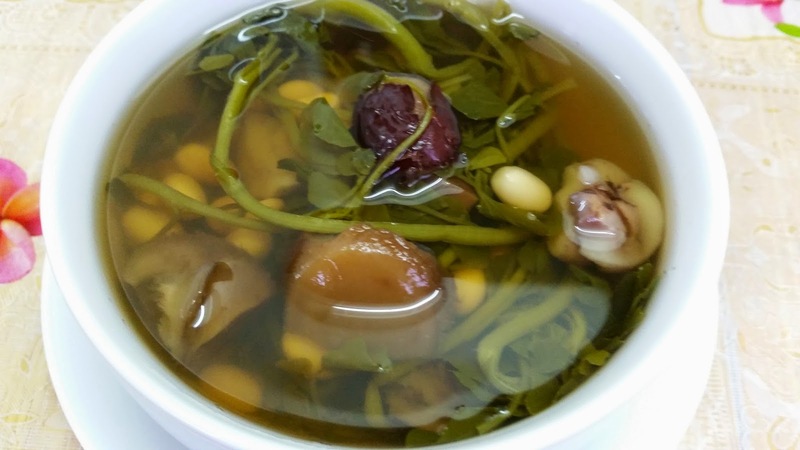 This soup is full of natural goodness! It is fat-free. It does not contain any monosodium glutamate. It's very nice! And watercress is good for clearing heat from our bodies. 1. Place the first four ingredients into a large pot and add in 2500ml water. 3. Reduce fire to low and allow soup to simmer for 2 hours or until the beans and chestnuts are soft. 4. Add in watercress and continue to boil for a further 30 minutes.